‘On The Edge’ Our Big Gig free music mini-fest was fast approaching; it was the Saturday before the event. The sun shone down at 28 and more degrees, the Marquee erection was a sweaty, sun stroke-inducing experience; nothing vexed OTE Team V and our host, venue supervisor, Dee, and yet more volunteers from Martineau Gardens. No doubt about it, we were going to have the best first music event at Martineau Gardens that ‘On The Edge’ could put together for £400, courtesy of the ‘On The Edge’ Our Big Gig broker Superact, and an ‘On The Edge’ budget to absorb the other x hundred pounds. Our Big Gig Sunday arrived — with a ‘ready steady’ sound crew (thank you Richard), Free Radio Van dispensing free ice-creams and a chance to win free Monarch flight tickets (e-mail us if you won folks), a glowingly qualified team of young under-grad and graduate teaching musicians giving free music workshops and a programme of free music to cater for a wide range of musical tastes, our audience of around 200 people throughout the course of the afternoon, stewarded by OTE Team V, were in one of the best spots to receive an intimate (and let’s say it again) FREE music experience this weekend. The heat (and taxis) slowed the proceedings a little, as did the queue for free ice-creams in the car park but the afternoon kicked off with a lovely set from the Mirage Sax Quartet, a more fitting introduction given the temperature and surroundings there could not have been. All members of the quartet then promptly moved along to set up instruments for ‘On The Edge’ instrument zoo workshops. A duo of spoken word and keyboard, Kamal and Ravi from Bournville College continued the first hour, and got the crowd shouting back responses with ease, as well as tweeting a youtube link the fastest! The second hour saw Rekesh Chauhan perform on harmonium and keyboard, accompanied by mesmerising tabla, and on a number of songs duets with Becky Woodcock, a just- out-of-the-blocks young clarinettist, recently graduated from Birmingham Conservatoire, and judging from the audience interest, much in demand. Rekesh maintains his renown for modern interpretation of Indian music. Samantha Jayne, an established saxophonist from Walsall came along to play some smooth/pop jazz that fitted the weather, and a sunny array of pleasing comments were voiced from the audience during intervals, with new private function hires to pencil in Samantha’s busy diary. The most exuberant entrance however goes to the Flautins Matua band who delivered a slice of Brazilian Street song to the ‘Our Big Gig’ audience — who by now were doing well not to melt like their ice-creams, one audience member even achieving to steal the dance later in the set. In the spirit of cultural exchange once more (and need we say fusion?) Becky Woodcock and Franco Villalta, a member of Flautins Matua performed a song together in the Pavilion after the Flautins Matua. Meanwhile, last but by no means least, the Ruben Fox Quartet, a slicker quartet you will not hear often enough – this quartet’s collective age probably still adds up to less than the oldest person on Earth. Ruben’s 4tet, comprising Ruben on sax, Moses Boyd on drums, Nick Jurd on bass and Andy Bunting on keyboard, (previously having played at the Old Joint Stock) found a quiet shady spot to chill patiently (Flautins arrived later than expected from their prior engagement at Simmer Down Festival in Handsworth), before giving a coolly resonant performance of jazz standards that made the music as fresh as if it were written yesterday. A serendipitous partnership of Brum and ‘Don with a 50:50 balance; Ed Haine also lent his chops to the set and the two saxes produced an equal sparring match. The set ended too soon despite ‘On The Edge’ Our Big Gig overstretching by at least 40 minutes. With impromptu musical performances being made by musicians who had not met before ‘On The Edge’ Our Big Gig, as mentioned before in the pairing of Becky Woodcock and Franco Alltavita, and memorably but regrettably unrecorded, a fine duet between Tom Durham and Ed Haine, the gardens were full of music blossoming from many branches. It sometimes seemed impossible for the OTE video team to be in all the places that music was being made. There were some children who learnt for the first time that they may have a propensity to play a sax, trumpet or violin; it was a joy to behold. 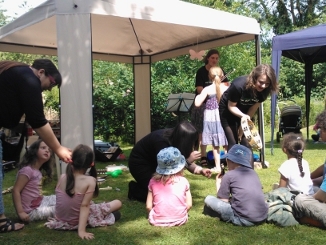 ‘On The Edge’ Our Big Gig was a truly family friendly event with a full programme and we look forward to producing events at Martineau Gardens again in the future. We can reliably inform that a slightly older than young person went home and took up the clarinet the following day. Thank you to Martineau Gardens, all our many energetic and generous volunteers, sound crew, gifted performing and teaching musicians who were evidently in demand across the city, promotions (Free Radio and Monarch Airlines), our volunteer refreshments courtesy of the Blakemore Foundation and especially our curious audience for making the event such a well-received and pleasing success. If you are enchanted and excited by the potential of this event to inspire young people and build new audiences for young professional musicians please strongly consider supporting ‘On The Edge’ by making a donation via our page on localgiving.com. We look forward to receiving you all at our next events and workshops. To watch this space please join our mailing list via the field to the right of this article. On the Edge – it was fantastic to welcome you to Martineau Gardens and hear your wonderful tunes filling the Gardens. We look forward to the next one!